Get ready, San Francisco, because this New Year’s Eve we’re delivering a high-voltage NYE adventure: the SF Bar Crawl. This is your ticket to seeing the best bars, clubs, and lounges that San Fran has to offer, all loaded with drink and food specials to keep your NYE energy riding high. Gather your crew and your party poppers because this is one action-packed NYE you don’t want to miss. Assemble your party team at The Dubliner, Downtown San Francisco’s favorite neighborhood bar, where friendly vibes and party spirits are always riding high. There, enjoy discounted Jameson and Guinness, to kick-start your NYE with an Irish classic. As night falls, head over to The Liberties, the premier bar and grill in the Mission District. Enjoy a pint of Anchor Stream or Trumer Pilsner and a shot of Jameson, all for $13. The party continues at Skylark, the SF cocktail classic that’s the darling of locals and travelers alike. As you enter beneath the glittering gold sign, discover the cocktail offerings and art murals that make this lounge so famous. With $2 off frozen cocktails including the El Chapo, organic Margaritas, and French Côtes du Rhône frosé, the Skylark is the ultimate venue to ring in midnight with a craft cocktail. Designed in a choose-your-own-adventure style, this party-hopping tour allows guests to find their own path and curate a night to remember. 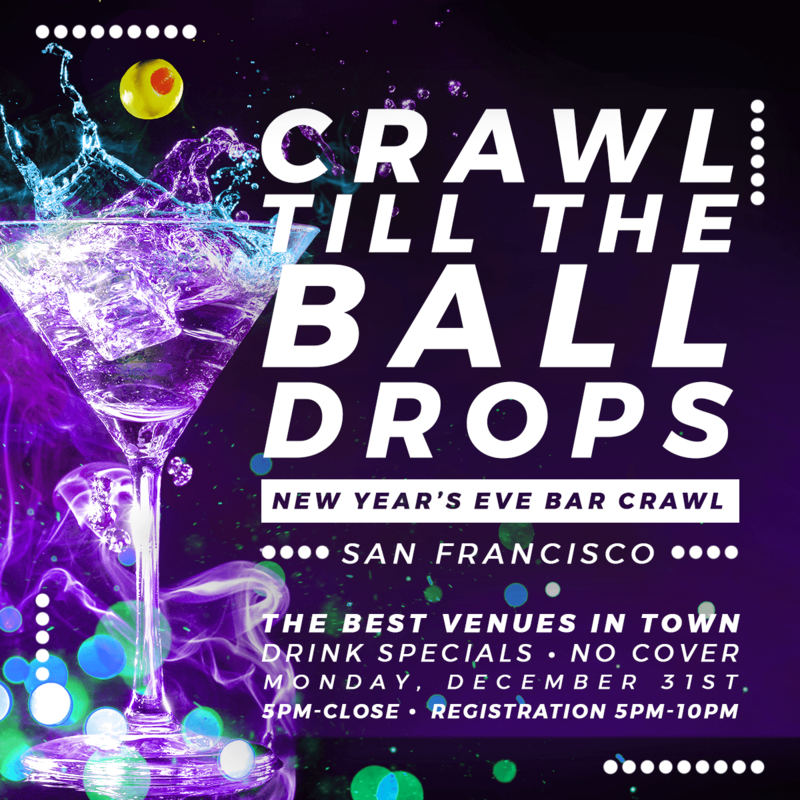 Crawl your way into the New Year, San Francisco, with the SF NYE Bar Crawl.